“The Big Bear Cycling Festival started out at the request of riders wanting to acclimatize to the altitude and to extend their riding time and enjoy our beautiful area that has made Big Bear Valley the Cycling Capital of Southern California.” The Win Group Real Estate and major sponsor Big Bear Vacations bring a major real estate and lodging component to the table for our riders – whether it’s a weekend cabin rental or a second home. The Festival week will kick off with a Community Trail Work Day on Saturday and on Sunday the NEW Mountain Top Trail Rally fundraiser from the Big Bear Valley Trails Foundation with a day of community activities and events including hiking, mountain biking and trail running. The week continues with free group rides, night mountain bike ride, Cyclefest Youth event, Professional Rider events and rides, Bicycle Concours, Poker Ride, Recovery Ride and Time Trials and cycling-centric events will be offered throughout the week culminating in the Tour de Big Bear road cycling event, scheduled for Saturday, August 5. 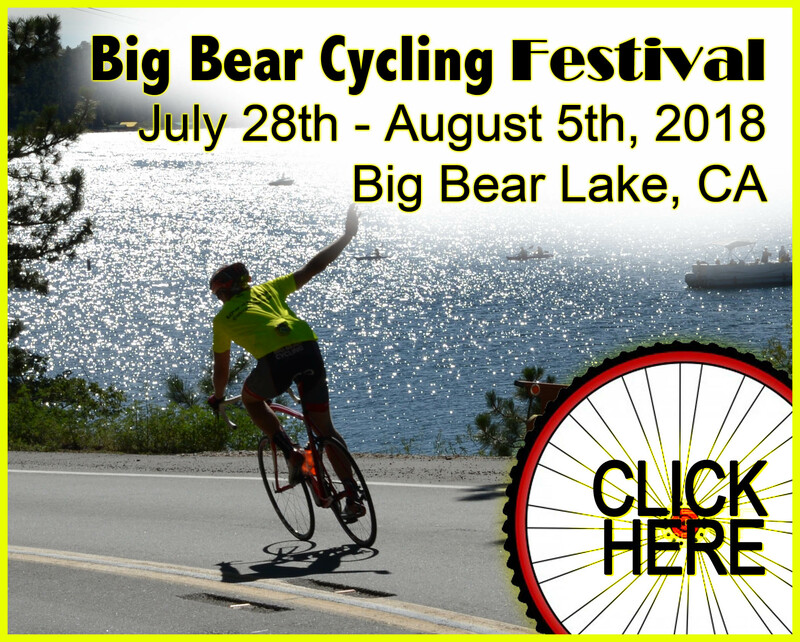 For more details and a current schedule of events, contact bigbearcyclingfestival.com. Tour de Big Bear – 25 mile route – over 1300 feet of climbing. Big Bear Valley Tour – 50 mile route –more than 3000 feet of climbing. The Grand Tour – 70 mile route – over 4,800 feet of climbing. THE CLIMB – 106 mile route – 8,000 feet of challenging climbing. Tour de Big Bear Weekend Events: BBCA will host a two-day cycling expo with 40+ cycling vendors, a complimentary bike valet for registered riders, entry into the Fat Tire Beer Garden, and live entertainment during Saturday’s festivities. Tour de Big Bear is a timed event and includes the Tour de Big Bear HC racing component and popular King/Queen of the Mountain Race Segment. Cash and prizes will be given to winners of those two competitive events. All registered riders will receive a goodie bag, custom-made finishers’ medal, and a high-performance, technical shirt. Each Tour de Big Bear distance will be staffed with Course Marshalls, numerous legendary nutrition/hydration aid stations, first aid attendants, and rider safety and repair vehicles. Rounding out the weekend is a FREE organized Recovery Ride and competitive Time Trial race on Sunday, August 6. Held in the high country of Southern California’s San Bernardino Mountains, road cyclists of all levels escape the summer heat and cruise alpine roadways and trails, over high mountain passes like Onyx Summit (elevation of 8,443 feet), and around Big Bear and Baldwin Lakes. With scenic and challenging high altitude rides, professional racing venue and a weeklong Cycling Festival, it’s no wonder Big Bear Lake is known as the Cycling Capital of Southern California.